Doctors fight to reverse rising stoke levels. Wikimedia Commons photo. MIRKWOOD, Calif. — Tahoe’s acting Emissary of Stoke Steven “Scoop” Scooper lost control of his stoke level Wednesday after receiving word that Mirkwood's upper elevations had received over three feet of fluffy, blower snow. Upon learning the severity of the big dump, the man suffered what medical officials are referring to as a "stoke attack," a condition caused by out-of-control, spiking stoke levels. Physical symptoms include panting, yelling and giving high fives to random strangers. “He kept screaming something about his stoke level rising,” South Lake resident Mikey Babcock, 26, told TGR. “The dude was, like, dry heaving stoke." After the onset of the stoke attack, Scooper allegedly rode pow for several hours. Attempts to hospitalize the snow reporter were thwarted by his repeated disappearance into what local experts are calling "the white room." Hours later — after tracking up most of the hill — Scooper was taken to Mirkwood's medical clinic, where he was given horse tranquilizers and shown looped golf footage in an effort to calm him down. There's no hope for him — he's just too stoked. 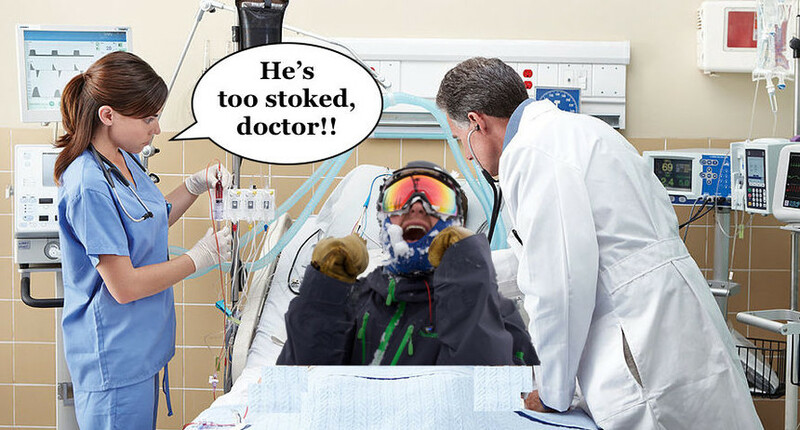 Attending physicians were reportedly stunned by the rapid onset of the stoke attack, but heartened by the eventual de-stoking of the overexcited spokesperson. However, despite seeing progress, many stoke experts believe Scooper will quickly redevelop his condition, and get stoked again upon release. "He's kinda out of options," Scooper's doctor said. "It's supposed to snow another foot tomorrow night. There's no hope for him — he's just too stoked."